Consistent with this interpretation, in this week’s Torah portion, we are told the following: 26:17 ‘You have today declared the Lord to be your God, and that you would walk in His ways and keep His statutes, His commandments and His ordinances, and listen to His voice. 26:18 ‘The Lord has today declared you to be His people, a treasured possession, as He promised you, and that you should keep all His commandments; (NASB) Notice how listening to the Lord God our Father in heaven is paralleled to keeping His statutes, commands, and ordinances. We are told, by declaring the Lord to be our God, we are called to walk in the way He has chosen for us as His people. As a result of doing so, The Lord has called us “le’Am Segolah” (לְעַם סְגֻלָּה), a treasured people, and it is repeated that being a treasured people, we are to keep His commands. These truths are apparent according to the Apostles delineation of the moral imperatives found in the Apostolic Writings and as enumerated in the “aseret ha’dvarim” (עֲשֶׂרֶת הַדְּבָרִים), the Ten Commandments. The opening verses to Parashat Ki Tavo provides context for the verses that call us a treasured people, we are told 26:13 ‘You shall say before the Lord your God, ‘I have removed the sacred portion from my house, and also have given it to the Levite and the alien, the orphan and the widow, according to all Your commandments which You have commanded me; I have not transgressed or forgotten any of Your commandments. (NASB) What is this “removing the sacred portion” (בִּעַרְתִּי הַקֹּדֶשׁ) described as something that is given to the Levite, the alien, the orphan, and the widow? Regarding the sacred portion, was it not supposed to only go to the Levite? What is Moshe trying to say here? The sacred portion according to the Torah is holy (הַקֹּדֶשׁ) and not to be eaten when one is in mourning, or unclean, and neither is a portion of it to be offered to the dead. What was going on in the land of Canaan that caused the people to offer food to the dead? According to Canaanite beliefs, when the physical body dies, the nephesh (“soul”) departs from the body to the land of Mot (the land of the dead). As a result, the bodies were buried with grave goods, and offerings of food and drink to sustain them for their journey and to ensure the dead would not bother the living. In addition, dead relatives were venerated and sometimes asked for help. (Alan Segal, Life After Death: A History of the Afterlife in Western Religion, Doubleday Religion; 1st Ed, 2004, 880) Here we are given the Torah command that as a holy people, as a treasured people before God, we are not to do such things. In this week’s portion we are reminded that God delivered Israel with a mighty hand and an out stretched arm. We are also given instructions for living as a holy people before the God of all creation. This is a very significant thing to consider, as Sforno on Devarim / Deuteronomy 26:18, points out in his commentary saying, וה’ האמירך היום, by entering into the covenant with you, a distinction He has not accorded to any other nation. וה’ האמירך היום במה שהוא נכנס בברית עמך נתן לך מעלה בזה: The covenant that we have with the Lord is a special, unique, distinct, and is a significant calling upon our lives. Do you agree? In Parashat Ki Tavo, from Devarim / Deuteronomy 26:13, we are told 26:13 ‘You shall say before the Lord your God, ‘I have removed the sacred portion from my house, and also have given it to the Levite and the alien, the orphan and the widow, according to all Your commandments which You have commanded me; I have not transgressed or forgotten any of Your commandments. (NASB) What is this “removing the sacred portion” (בִּעַרְתִּי הַקֹּדֶשׁ) described as something that is given to the Levite, the alien, the orphan, and the widow? The Talmud Bavli Berakhot 35b provides some insights into the meaning of this text. What is the broad topic of the discussion? What does the author intend to say? Is it a statement of fact or a concrete instance? o What underlying principle does it involve? o Is it a broad generalization? o What exactly does it include? o Is it a general exclusion? o What exactly does it exclude? Under what circumstances is the statement true? Under what qualifications is it permissible / forbidden? Is there a subsequent statement that modifies or invalidates the statement under consideration? The harmonization of apparent contractions and interlinking of apparent irrelevancies are two characteristic features of the Talmudic method of text study. Why does the Author use one word rather than another? What need was there for the mentioning of a specific instance as an illustration? How does the contrast between the illustrations influence the interpretation and application of the Scripture? Do certain Authorities differ? If they do, why do they differ? According to Parashat Ki Tavo (Devarim / Deuteronomy 26:1-29:8), specifically, Devarim / Deuteronomy 26:13 the Talmud Bavli Berakhot 35b has some interesting insights concerning the sacred or holy thing. Asking these questions, such as in the case of the “Talmudic Hypothetico-deductive Method,” we have the following questions, (i) What is the broad topic of the discussion? (ii) What is the underlying principle? And (iii) What are the rabbis intending on conveying by the discussion? A short summary of the Talmudic discussion. 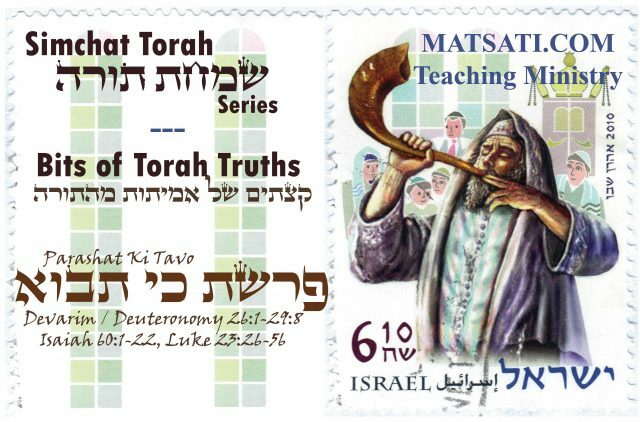 The rabbinic discussion opens with a discussion on the verse in question (Devarim / Deuteronomy 26:13 “… I have removed the sacred portion from my house…”) The rabbis speak of the former generations as opposed to the later generations with regard to the tithe. The former generation brought their fruits into their home by way of the kitchen, making them liable to the command whereas the later generation brought it by way of the roof and the courts to exempt themselves from the tithe. The discussion changed to that of wine, whether one should say the benediction over the wine, and why there is a change in the benediction over wine as opposed to oil as detailed in the Sidur (the rabbinic prayer book)? One says a blessing over the wine and not the oil because one nourishes while the other does not. One does say a blessing over the oil when one eats bread with the oil upon it. The idea is that the benediction is uttered over the former, and there is no necessity for a benediction over the later. Is this a discussion about the benediction before and/or after eating, or about the tithe? The rabbis speak of the importance of the benediction over what we eat, why? They also discuss when is the benediction not necessary as opposed to when the benediction is always necessary? This is related to our Scriptural context which states, Devarim / Deuteronomy 26:18 ‘The Lord has today declared you to be His people, a treasured possession, as He promised you, and that you should keep all His commandments; (NASB) In the Talmud, the rabbis open with the former generation, who appears to be obedient to the command in the sense that they make themselves obligated (liable) to the tithe, as opposed to the later generation which attempted to find exception by bringing in the fruit (tithe) through another entrance to their home. The idea is that as a treasured people of God, we should always be doing what is good and right in the sight of the Lord God in heaven. The discussion follows in the Talmud how one has reasoned within himself over whether he is obligated to the tithe the fruits of his labor. It appears that the righteous generation did what was right and obeyed the command, as opposed to the wicked generation that took it upon themselves, going great lengths to exempt themselves from the tithe, even climbing upon the roof in an attempt to state they are exempt and may eat their fruit and not have to give any to the priest, the widow, the poor, or the stranger. It is interesting how the discussion proceeds to blessing over the wine, oil, and bread. Do you think, in the Messiah Yeshua, that we are obligated to be thankful for what God has given us? In Midrash Tehillim 75, Part 6, the rabbis say that through sin, Israel had their lifted up horns removed which were then given to the nations to make war, to destroy, to burn, and to kill. Notice how in the hands of Israel, when the Lord lifts up the horn of Israel (“horn” referring to God honoring and blessing a person), we find the lifting of the covenant of God, of peace, mercy, justice, and truth. On the other hand, when the lifted up horn is given to the nations, there is nothing but destruction, wickedness, pride, unrighteousness, and lies, which is paralleled to the fourth beast in the book of Daniel, dreadful and terrible. The heathen nations are those who reject God’s Torah, they are not a treasured people, and are symbolized by the beasts of destruction in the book of Daniel. As long as the horn of the wicked endures, the horn of Israel will remain cut off. On the other hand, the midrash states, “but the verse further proves that when God lifts up the horns of the righteous, He will also cut off the horns of the wicked, as is said, All the horns of the wicked will I cut off (Tehillim / Psalms 75:11). Then The horns of the Righteous One will be lifted up, that is, the horns of Israel which the Righteous One of the universe had cut off.” When the Lord lifts up our horn, when He honors us, brings prosperity and life; when the Lord does these things, do we show forth the mercy, forgiveness, love, justice, and truth that we are supposed to? When the Lord honors man, as it is described in the Torah portion on being a treasured people, his response should be to bring glory to the Name of the Lord. In the Talmudic discussion on the former and the later generations, we seem to be given a subtle message of how we are to act and respond based upon being a treasured people, obedient to God’s Word. Take for example, in Midrash Tehillim 75, Part 4, the rabbis describe the purpose of the golden calf. They say that the golden calf was constructed (“used or made,” ועשו אותו מעשה) in contempt to Moshe ואמרו כי זה משה האיש “saying, as for this man Moshe… etc.” The people were in the process of finding their own way, by the work of their own hand, which is illustrated in the “half shekel” example of the rabbis saying they raised themselves (raising their horns, they honored themselves) by heeding the “this” of the command, meaning that they took hold of the command with the motivation that they could save themselves by performing the command of the half shekel. The Scripture clearly tells us that we are not able to save ourselves and the command is not meant for self justification. The Scriptures says, “The Lord has today declared you to be His people, a treasured possession, as He promised you…” Notice how the promise and the declaration comes first. We are then told, “… and that you should keep all His commandments” (NASB) which follows second.